I marinated the chicken breast with lemon juice, a little olive oil, salt & pepper and I add Italian seasoned bread crumbs. I let this sit for an hour in the fridge and then bake it in a convection oven at 350 degrees until the crumbs are slightly golden and the juices run clear. 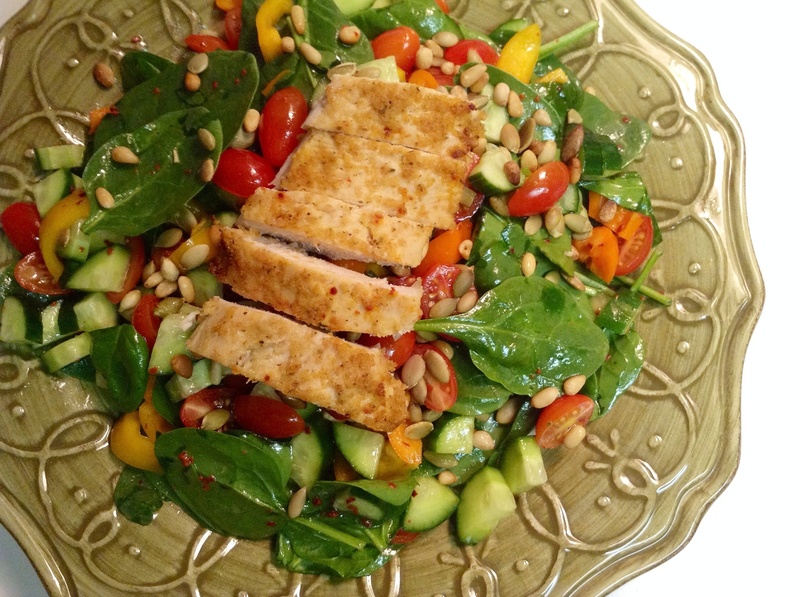 This chicken is so tender and juicy and pairs perfectly with the salad. I add baby spinach, bell peppers (add any color you’d like), Persian cucumbers, cherry tomatoes, toasted pine nuts and pumpkin seeds all into a large salad bowl. I cut up the bell peppers, cucumbers into bite size pieces and the cherry tomatoes I cut them in half. I squeeze the juice of one lemon right on top of all the ingredients and add some extra virgin olive oil. Add salt and pepper and mix it all up. I love my salad with an extra kick to it, so I add some red pepper flakes to mine. Once the salad is mixed, add it onto a plate and top with the baked chicken. And there you have it, yummy chicken salad!